WASHINGTON (CNN) -- As absentee ballots pour in from U.S. troops overseas, officials are voicing concerns that many of those votes won't be counted. 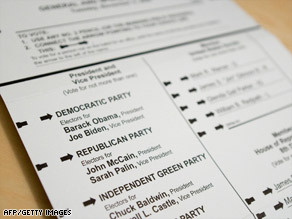 An absentee ballot from Arlington County in Virginia shows the names of the general election candidates. "It's dismal," said Rosemary Rodriguez, who works for the U.S. Elections Assistance Commission, a non-partisan group. "These are the voters that are in some cases preserving our liberties and out there with their lives on the line." Rodriguez estimates that in the last general election, only about 30 percent of overseas military ballots were actually returned and counted. "It's disenfranchising our military and frankly I think it's very unpatriotic," said retired Navy Lt. Melissa Cox Boss. A part of the problem is that each state has its own rules for absentee voting, and those rules can change in the middle of an election season. In Virginia, for example, the federal write-in ballot required a witness' signature and address. That proved confusing for soldiers overseas because there was no box provided for a witness address. Rokey Suleman, the Fairfax County registrar, initially said he would have to discard 63 votes because voters neglected to provide a witness address. iReport.com: Are you voting early? "These ballots that aren't being met -- I can't accept as valid ballots at this point. If the law changes, I welcome a review of the law. I think the law is horrible," he said. Late Monday, Virginia's attorney general agreed, saying all county registrars could ignore that part of the law. Other areas, like Arlington County, refused to disqualify the absentee ballots that were filled out improperly, contributing to the the AG's decision to intervene. Another part of the problem is that delivering mail from a battlefield can be challenging, according to Rep. Kevin McCarthy. McCarthy, R-California, says absentee ballots mailed from war zones are not getting to county registrars fast enough to be legally counted. "With all the modernization that we have, we should be able to move these ballots, track them at the same time, bring the modernization and technology we have today to make sure our heroes across this world get treated fairly," he said. McCarthy said he is pushing a bill through Congress that would address these issues, but not in time for this election. Overseas absentee ballots were at the center of the Florida recount during the 2000 presidential election between George Bush and Al Gore. Bush aides and Republican surrogates blasted their Democratic rivals for having overseas absentee ballots disqualified in Florida counties, many for lack of postmarks. Many of those ballots were presumed to have been from service members supporting Bush. Joe Lieberman, the Democratic vice presidential candidate, denied that charge and said that the disputed votes deserve the "benefit of doubt." "[Gore] and I would never authorize and would not tolerate a campaign that was aimed specifically at invalidating ballots from members of our armed services, and I've been assured that there were more absentee ballots from non-military voters that were ultimately disqualified," he said during an interview on NBC's "Meet the Press." More than a month after the election, the Florida Supreme Court upheld two state court rulings that cleared the way to count thousands of ballots in predominantly Republican Seminole and Martin counties.